Story and information are so tightly wound together in this stunning book it is hard to separate one from the other. That’s why the text is written in two sizes. The story is in larger font and the additional information is in smaller text. The detailed full page illustrations created with mixed media draw the reader into the water world of the platypus, one of the few venomous mammals in the world. The full page illustrated sequence is broken only twice. Once it shows two pictures on one page of platypus emerging and submerging. The second is at the end where platypus snuggles into his burrow after long hours of foraging. Male and female habits are exposed. Parenting methods, nesting habits, and how the nestlings are protected are revealed. Hints on their personal grooming and their fat storing tails are also uncovered. Earthy colours, tangled tree roots, shapely rocks and running water fill the pages. 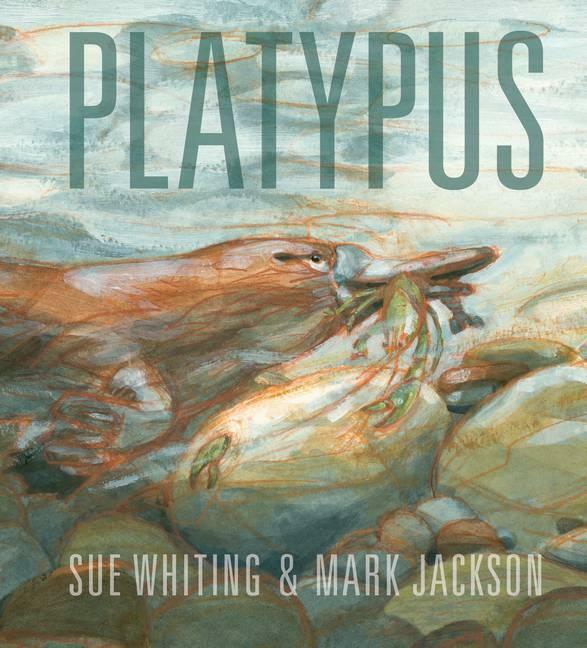 This is a superbly visual book on the life and habit of the ‘puzzling platypus’. It is the kind of book parents and family want to buy for their children. It will mesmerise them as they read and learn about these fascinating mammals. Overseas visitors will want to take this book of incredible beauty home with them. Schools and libraries should rush to get this on their shelves. Mark Jackson has done an outstanding job translating Sue Whiting’s text. The covers, end papers and everything in between is of the highest quality. It is suited to the 6 - 100 age groups, and for discerning collectors of magnificent picture books.